Tempering chocolate is an advanced technique that requires skill, concentration and a good thermometer. It involves slowly heating and then slowly cooling the chocolate so that the fats crystallise uniformly and the chocolate ‘snaps’ rather than crumbles when broken. Tempered chocolate is often used to coat truffles to provide a smooth, polished finish. It also has the advantage of having a higher melting point which is useful for when the chocolate is being handled. There are two main methods for tempering chocolate. For both methods, you will need a thermometer and good quality chocolate with a high cocoa content. Use the traditional method when tempering over 1kg of chocolate. When it comes to tempering chocolate, the slower you melt the chocolate, the better the result will be, so take your time. Bring a pan of water to a simmer and then remove from the heat. Break the chocolate up into small chunks and place in a bowl. Set the bowl over the pan to make a bain-marie, ensuring the bottom does not come into direct contact with the water. Let the chocolate gradually melt to 55°C for dark chocolate and 50°C for milk and white, stirring slowly and continuously. Remove from heat and pour three-quarters of the melted chocolate on to a cool marble slab, leaving the rest of the chocolate in the bain-marie. 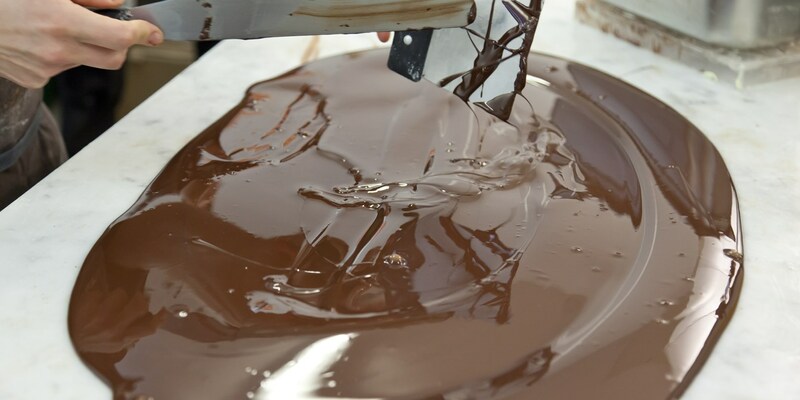 Work the chocolate across the surface using a palette knife until it reaches 27°C. Return the chocolate to the bowl and stir well to incorporate all of the cooled chocolate with the remaining chocolate in the bowl. The temperature should read 31˚C – if the chocolate is hotter than 32˚C you will need to repeat the process again; if it is cooler then heat up to exactly 31˚C. For milk chocolate the temperature is 29˚C and for white it is 28˚C. Bring a pan of water to a simmer and then remove from the heat. Break the chocolate up into small chunks and add three-quarters to a bowl. Set the bowl over the pan to make a bain-marie, ensuring the bottom does not come into direct contact with the water. Let the chocolate gradually melt to 55°C, stirring slowly and continuously. Remove from the heat and add the remaining chocolate pieces. Slowly stir the chocolate until it melts and reaches 27–28°C. Place the bowl of chocolate back over the pan of water and set over a low heat. Reheat to 31–32°C, making sure the chocolate does not exceed 32°C. Tempered chocolate solidifies quickly as it cools so it is important to maintain its temperature in the time between tempering and using the chocolate. Ideally, keep a bain-marie ready and as soon as it starts to cool, briefly reheat to keep the temperature steady. If the temperature gets too high or low, it will lose its tempered properties and will need to be tempered again. When chocolate hasn’t been tempered properly, the cocoa fat rises to the surface and ‘blooms’. Poorly tempered chocolate looks unappealing and has a dull, streaky, white surface.